Thomas Edison was born on February 11th, 1847 in Ohio, United States. As a young boy Edison grew up in Michigan with his six brothers and sisters and his parents Samuel and Nancy. He did not go to school and instead was taught by his mother at home. When he was a teenager in order to supplement the family income he sold candy and newspapers on the trains near his house. Later Edison became a telegraph operator. ​Edison married twice and had a number of children. However, he preferred to be in the lab and be experimenting rather than being with his family. Although this was not great for family relations it did allow Edison to spend time inventing. For example, in 1876 Edison famously developed his own research laboratory called the Menlo Park Laboratory. Edison built the laboratory in New Jersey by using the funds from the sale of his Quadruplex Telegraph, which was his first major success. The lab was set up in order to produce technological innovation and improvement, and it was very successful. In fact, the Menlo Park Laboratory was not just a place for Edison to work, but also served as a site for other inventors that wanted to mentor and train with Edison. In general, Thomas Edison directed the research of the people working at Menlo Park and took full legal ownership over any innovations created in the laboratory. During his time at the lab, working with others, Edison developed the first voice transmitter, a pre-cursor of the telephone, and the first successful lightbulb. Both inventions were important in order to allow people to communicate, and to allow industry and families to function, even at night. For example, he invented the phonograph in 1877, which is a device that recorded and reproduced sound. It was the first device to ever do this and amazed the American public at the time. It was so well received by the public that Edison was enduringly called ‘The Wizard of Menlo Park’. In 1878, Edison began work on likely his most famous invention – the incandescent lightbulb. At the time, most of the lighting in homes and business was from either gas or oil lamps. In fact, several other inventors had previously introduced their own versions of the incandescent lightbulb. However, these earlier version suffered from some major shortfalls, including: short lifespans and expensive. As such, in 1878, Edison set out he develop the first incandescent lightbulb that could be used on a mass-scale and replace the gas and oil lamps. He officially obtained a patent for his version of the lightbulb, which used a carbon filament on January 27th, 1880. Based on this new invention, Edison and a team of financial backers developed a new company called the Edison Electric Light Company. He made his first demonstration of the lightbulb in Melno Park on December 31st, 1879. It was at this time time that he famously stated that “We will make electricity so cheap that only the rich will burn candles”. Edison’s incandescent lightbulb was the first mass-produced electric lighting solution and was sold across the United States and Europe. ​In fact, Edison started his own electric utility company (Edison Illuminating Company) in 1880 and began delivering electricity for his light systems to customers in New York City. However, as time passed, Edison’s design for Direct Current (DC) delivery system faced stiff competition from the competing Alternating Current (AC) systems that were being developed by the Westinghouse Electric Company. Edison continually dismissed the AC designs and was eventually removed as the head of his own company in 1892 by prominent financial stakeholders, including J.P. Morgan. After his departure, Edison’s company merged with another electric company of the time and became known as General Electric. During his lifetime, Edison helped to pave the way for a new era of technology. He was a freethinker and his talents as a businessman and inventor enabled him to develop over 1000 patents, and over fourteen companies, one of which was General Electric, which remains one of the biggest publically traded companies globally. 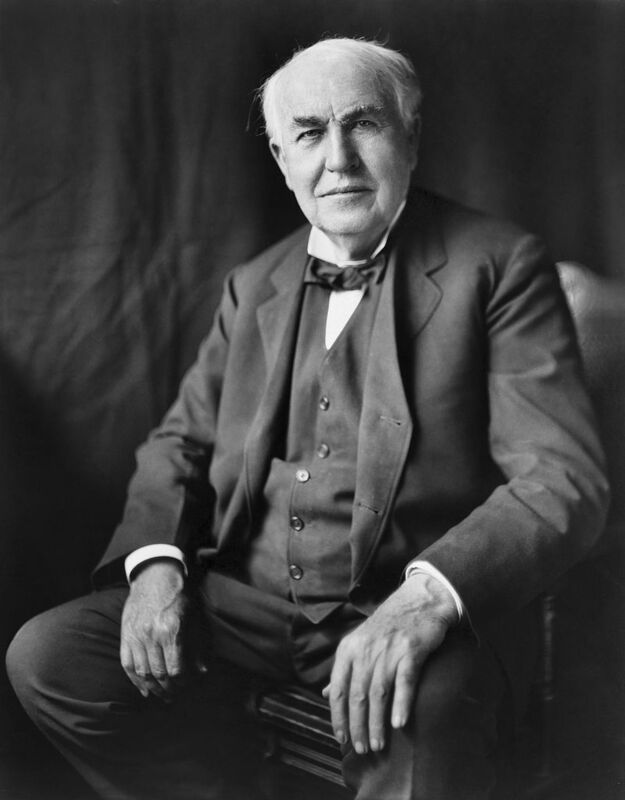 In fact, while Edison is remembered today for inventing the lightbulb and phonograph, he also played a significant role in other fields of study and led to many other inventions. These included: fluoroscopy, telegraph, motion picture camera, battery, and different types of chemicals. Thomas Edison died on October 18th, 1931 and will be forever known as one of the single greatest inventors in the history of the United States.